Hospitality venues like the Yas Viceroy Abu Dhabi are far and few. When I think on it further there is nothing comparable to it. The Yas Viceroy Abu Dhabi is a Xanadu of surreal luxury, set within architecture that takes you out of your everyday and reminds you to live. Earlier this month, I had the pleasure of staying for two unforgettable nights during my seven night stay in Abu Dhabi, United Arab Emirates. The Location: The Yas Viceroy is located on Yas Island, Abu Dhabi, UAE. The United Arab Emirates, a former British protectorate, now an independent Arab country along the Arabian Gulf is made up of seven states (Emirates). These states are famed for their wealth, and iconic architectural projects, particularly Abu Dhabi’s neighbor Dubai. The island is a short 30 minute drive to Abu Dhabi’s city centre, and 50 minutes to Dubai. The Design: I followed the design process & construction of this wondrous hotel via construction forums & news announcements, so I was thrilled to see it in person. New York architects, Asymptote Architecture, worked closely with designers Jestico + Whiles and Richardson Sadeki to create this iconic structure. The hotel is something out of a Bond film; it has a mega-yacht marina and an F1 Grand Prix racetrack that surrounds it on three sides. The design is drastically futuristic; the hotel comes alive at night with LED color changing lights that are embedded in a steel canopy, enveloping the hotels two towers. My Room - Deluxe Guest-Room: I began my first night in a deluxe guest-room, located in the hotel's main building. The room had a wonderful view of the marina and the F1 racetrack. The room features huge floor-to-ceiling windows, and the room measures 581 square feet or 54 square meters fitted with custom furniture and designer fabrics. Overall, the deluxe guest-room is perfect for even the most demanding business or leisure traveller. The Island Suite: The second night I upgraded to a suite I will never forget - The Island Suite. Located in the hotel's marina building, island suites offer 1,500 square feet or 145 square meters of living space, and include floor-to-ceiling glass windows for natural light throughout and exciting views across the Yas Marina and its F1 racetrack. Island Suites include a separate living room and bedroom. These palatial suites offer an executive workstation and lounge area ideal for relaxing, entertaining or a holding a small meeting, fitted with a state-of-the-art, surround-sound home theatre system. The Island Suites also feature two wall-mounted flat-screen televisions in the bedroom and living room walls. The Island Suites feature state-of-the-art technology, including remote-controlled curtains and lighting that guests can adjust to suit their mood. Words cannot describe the beauty and unfiltered luxury of the Island Suite, the name is well suited as the marina building itself is an 'island,' that sits in the waters of Yas Marina. I highly recommend this suite as a top bucket-list option for all travellers; you will never want to leave. I most certainly will return to experience this extravagant luxury. Gastronomy & Facilities - Food & Beverage: There are twelve dining and lounge venues at the Yas Viceroy. I tried four: Atayeb a Mediterranean/Arabic restaurant, Nautilus a fine dining seafood option, Noddle Box a Southeast Asian venue, Origins an all-day international dining venue, and Skylite Lounge a rooftop bar unlike anything out there. Other culinary dining options feature Japanese and Indian cuisines. Final Thoughts: I was more than satisfied with my stay, from the wonderful foods and excellent service, to the surreal interiors and exteriors, it all overwhelmed my five senses in a way only the Yas Viceroy can do. It was so good of a stay, I felt a tad bit melancholy leaving it all behind. Staying in the Island Suite was one of my grandest hospitality experiences, and with 1,500 sq. ft. of designer interiors all to myself, it's easy to understand why. I recommend this hotel in the highest regard because it is has such an unexpected sense of place; there is a surreality to its futuristic ambiance. 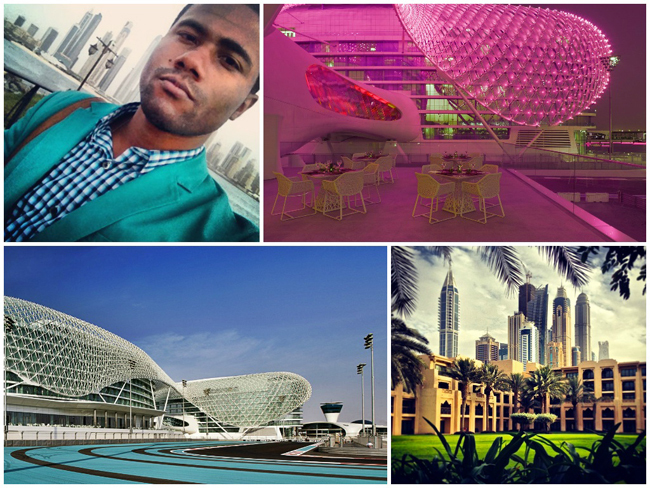 I left the Yas Viceroy with one of the brand's signature slogans embedded within me, "Remember to Live." I certainly will, and I encourage traveller's to visit the hotel from November through April, these are the cooler months of Abu Dhabi. Plan your stay around the F1 Race Week, which takes place every November.